"We all liked to hunt, trap, fish, swim and spend time exploring in the woods, bluffs, rivers, and creeks. We all knew where to look for everything in their season. All these trees, plants, and vines I am writing about grew in different soil environments, and having been taught them from our Dad or our brothers, we learned the different species and names of trees, vines, and plants in our area. I will try to describe some of these and their benefits that they brought to a boy growing up on a farm in the country. "First, I would like to mention the locust tree. Just across the small stream on our farm, some of these trees and things I will be writing about grew and thrived within a few miles of our farm, some growing about 100 feet tall. In hunting and exploring, we knew where we could find something good to eat. This locust tree is the only one that produced fruit that I ever saw in my boyhood. It was a fierce looking tree, covered with prickly thorns, 3 to 6 inches long, with sharp needles. It would be impossible for any kind of animal to climb this tree among those terrible thorns. Even though this tree brought horror to look at, it produced fruit. Its branches were filled with a kind of a bean, 12 inches or so long, and about 2 inches wide, flat like a bean. In these pods on the inside of each edge was a substance like jelly or honey, and in late November or December, as these turned to bronze or black, we would pick them that had fallen from the tree. They sure tasted good. So we boys like to go to the old locust tree in the fall and winter, especially when we were out rabbit hunting. "The prickly burrs opened up on the chestnut tree in late September, and the nuts began to fall. What joy it was to find them and fill our pockets! We boys would get up early to go to the chestnut tree as soon as it was daylight enough so that we could see the nuts. We had lots of hogs and pigs, and they loved these nuts, so we made sure we got there first, especially after a windy night. There were four big chestnut trees on our farm, and that species of tree grew by the millions. Those trees are all gone, not here any more, because a blight disease came along and killed them all in the early 1920's. 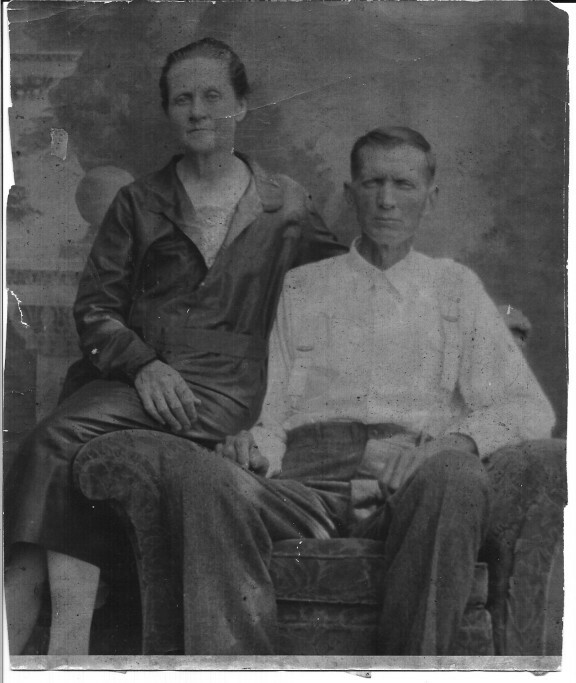 The Lewis brothers whose parents were Jesse Golden Lewis and wife Belle Reed Lewis are shown in this photograph. 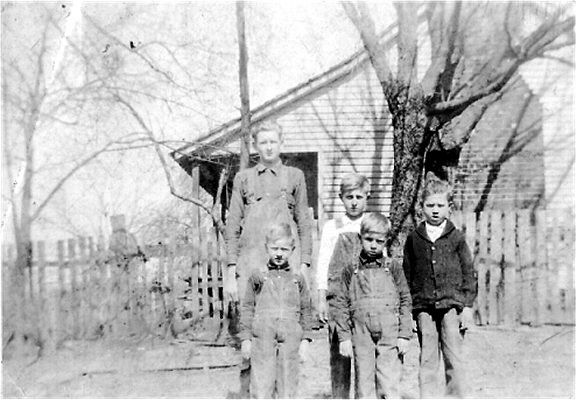 Front row: Jack Lewis; Doyle Lewis; and Deloy Lewis; Back row: Frank Lewis and Jesse Lewis. "The chinquapin tree was like the chestnut tree, but it grew in small bushes, in clusters with prickly burrs. You could pick them from standing on the ground. These nuts were black as jet, about the size of the end of the little finger, with a sweet edible nut solitary in the burr. On, to have a pocket full of chestnuts and chinquapins! Most of these aren’t around anymore. They are gone because of disease and man’s destruction. "Walnut trees were plentiful on our farm, and they produced an abundance of nuts. They were also very valuable as timber. In early 1904, the stumps and the roots were sold to be used for gun stocks. These trees grew in all parts of our farm, especially around the house. They would be so full of nuts that the trees would be at the breaking point. After the first big frost, they would fall from the trees. Many times I remember that at that time of year, I would throw a heavy stick into the top of the tree. The nuts would come showering down, sometimes a bushel at one blow with my club. What fun to gather these nuts! We would store them in the old smoke house for our eating on those long, cold winter months. We would also take them by the sack full to Livingston where they paid us by the pound. A few bags full would bring three or four dollars. We always looked to this time for gathering walnuts for a little money. There were some walnut trees that grew only in a certain place on our adjoining farm called the white walnut. It was oblong, not round like the black walnut. We would gather some of these, but there was not market for this kind. They did not taste as good as the black walnuts to me. "How we loved to hunt hickory nuts! They were gathered in the fall, as were the walnuts, after the first big frost. There were different kinds of hickory nuts. There was one tree called the scaly-bark hickory. The nuts from this tree were easy to open. With just a little blow of the hammer, and it was ready to eat. The other hickory nuts were hard as rocks. We would use a horseshoe nail to pick out the goodies. Most of these nuts are harvested in the late fall, around the time of Thanksgiving and the Christmas season. "The most enjoyable time in my boyhood days was out hunting. We would come upon a persimmon tree in late December, after the heavy frost had taken that bitter taste out. They sure were sweet and good. It was a good place at night to find a big old possum eating his fille on those juicy persimmons. My dog, old Joe, liked this fruit too. He would go to these trees and find those that had fallen on the ground. I often set steel traps under the trees to catch a possum. One morning I went to see if I had caught anything and to my horror, there was my dog, Joe, lying there on that cold, frosty morning, caught in my steel trap. Old Joe looked with thankful eyes to me as I pressed my foot on that trap to release his foot and set him free. I never set that trap there anymore. "There is a tree called the haw. It grew in clusters of berries, and had the size and taste of raisins. You might find the trees growing on the banks of the small streams. They never grew very tall, about eight or ten feet high. "Hazel nuts were the joy of our hunt when we found a bunch of these bushes. They usually grow in patches in swampy or very wet low ground. Sometimes you would find them hanging over a little stream of water. There was a husk covering the nuts, and we would pull them in clusters, filling our pockets. We would remember where the trees were so that we could find them again. "Oh, how we like wild cherries. I have spent hours feasting on these. I would climb up a tree, find a big limb to sit on, and eat my fill. They were about the size of a white navy bean. We boys and the birds would soon thin that tree of its fruit. Wild cherry timber is very expensive for furniture, instruments, and gun stocks. "The mulberry trees were usually laden with berries, but I never liked them too well. They were about the size of a pencil, about one inch long, real black. Farmers used this tree for plow handles and making wagons and farm tools. Papaw trees grew mostly about creeks and rivers. However, we had some of these trees in our yard at the old home place. No doubt, somebody planted them in years gone by. They were good and tasted somewhat like a banana with fruit inside. They got ripe in the middle of the summer. "There was a tree called the hackberry. These trees were full of berries the size of, or a little larger than, a B.B. pellet. This tree could often be found in the area where grapevines grew. The birds usually cleaned this tree, coming in flocks of dozens in late November. We would eat the ones we picked from the lower limbs, but the birds and squirrels took care of those in the tops of the trees. "There are many species of oaks. The red oak has really small acorns and so does the post oak tree. We would sometimes eat the acorns from these two trees. Other bigger acorns were bitter, and didn’t taste very good. "There is a tree we called the sarvis tree. You could find one in the woods now and then in the early spring. You could see a white dot from the blooming of the sarvis tree before the other trees began to get green, as it was one of the earliest trees to bloom. They were often left to grow on our farm. We would climb up and sit, eating our fill of sarvis. They were a pink, reddish color about the size of a navy bean, some even bigger. I well remember these two trees that were by the filed where I was plowing when I had the tragedy of breaking my dad’s plow. I will never forget that place and time. "You could usually find May Apple plants growing in the area of pawpaws. This is a plant that grows six to twelve inches tall, branching into two prongs. There is a male and female species, but only the female produces May Apples. The fruit smells really good, but was not good to eat. They grew in certain places in the deep woods. In one spot, there would be hundreds with their roots intertwined. Back in those days, there was a market for this plant. You got good money for the roots which were used for medicine. "What a joy to find a tall tree covered with vines and clusters of wild grapes hanging down! We would spend hours swinging and playing on these grapevines, calling them our grapevine swing. There were different kinds of grapes, but the kind we liked best were fox grapes. They were almost as large as the grapes that my grandmother planted that grew on the garden fence. There was another that we called possum grapes. They had vines that grew in the tall trees and we could never gather them. Those grapevines are the ones we often used to swing on and have such fun. The grapes were small, but the birds and squirrels usually found them. There were some vines in my woods where we lived in Tennessee, five or six inches in size, probably over 100 years old. "In the early summer months, we enjoyed going to our favorite wild strawberry patch. We had found where the patch grew in our exploring from time to time in the past. Strawberries were usually found growing around rocky bluffs where there was a risk of getting snake bitten. The common blackberry grew in most any area of the country, and in July and August, we would pick them by the gallons, and sell them for ten cents a gallon. There was a big juicy dewberry that was larger than the regular blackberry. It grew on the ground with ten to twenty foot vines. I like to eat those dewberries and they tasted better to me than the blackberry. One of the berried we like to find was the huckleberry. These berries were usually found on high, dry ridges. There were two different kinds, but the ones that got ripe in midsummer were the best. They grew in patches of little bushes, ten to eighteen inches tall, and were about the size of a navy bean, and a deep blue color when ripe. Some people call them blueberries. The other kind of huckleberry grew on a bush eight or ten feet tall, and ripened in late fall or winter. They were dark black when ripe. I remember some places on Spring Creek on the bluffs there would be growing a plant called teaberry. We called it mountain tea. It grew three or four inches tall, and had little red berries growing from the center of the plant. We would chew the leaves and berries. It was exactly the flavor the teaberry chewing gum could be bought in a store." Eva Alford describes her Uncle Frank as being a very religious person and someone who definitely believed in prayer. 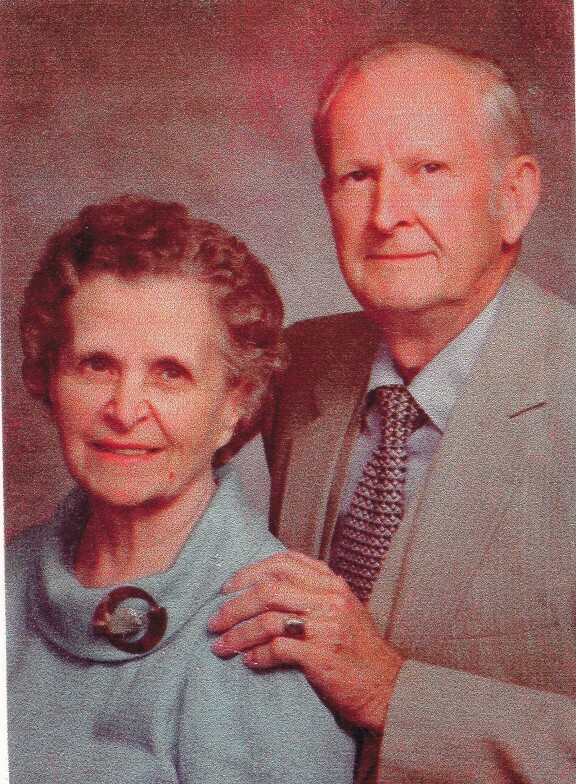 She said she always asked him to send up a prayer on her behalf because she believed that if anyone’s prayers were listened to, it was her Uncle Frank’s. After thinking about the things Mr. Lewis shares concerning the types of trees and wild berries that grew when he was boy, I have to wonder if the ways of life he describes that included lessons from his father, grandfather, or uncles on how to identify trees and plants no longer exist. Do small children have the opportunity nowadays to get out and roam in the woods with a grandparent? I hope the answer to that is yes, they do, because I would hate to think that part of life that came so naturally even for a young boy growing up in the 1940's could only be learned about from recorded memories of another generation. Jesse Golden Lewis and wife Belle Read Lewis.